Regain the ability to do the activities you were once used to doing with support from us. 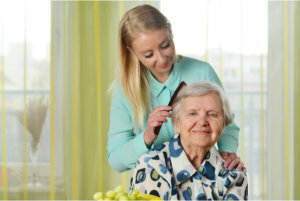 Personal care services require a relatively higher level of care than companion services or homemaking services. These services generally include assistance with ambulating, bathing, dressing, grooming, transferring assistance, and medication reminder with self-administered medications. Caregivers provide care to individuals who want to maintain their dignity, pride, and independence at home and need assistance with short-term or long-term illness, disability, injury, cognitive disease or the natural aging process. Precious Time’s goal is to provide our clients and their families with independence and peace of mind by providing the highest level of care possible that you and your loved one can only receive from professional caring caregivers who truly understand the value of human interaction and communication.